After much consideration, you've chosen a deck over a patio. Now what? It's time to figure out the important details that will push your project beyond a sketch on a napkin to become an actual outdoor living space. Decks can be connected to a house or detached. Decking materials include softwoods, tropical hardwoods, synthetic woods and pressure-treated lumber. Then there's the type of deck you desire (like wraparound, pool deck, etc), along with shape, size and even the placement pattern of the wood. Unlike a patio, there can be more involved in deck planning. Since decks are raised, they may require a blueprint and engineering. A permit may need to be submitted to and approved by your local planning department. If this is going to be a do-it-yourself deck project, you will need a design or plan, along with special tools and equipment (i.e. circular saw, jig saw). If you aren't up for the task, you will need to find a contractor or subcontractor to do the job. And, of course, there's the budget, which often dictates just about everything. A picture can spark a great idea, and helps immensely when you aren't quite sure how to get started. Perhaps this deck design slideshow includes the inspiration for your dream deck project. That's not the case with this house, which is perched on a hill overlooking a river. The narrow balcony-style deck is relaxed, comfortable, and all about that breathtaking view. A deck positioned so high needs to have protective railings, which, in this case, is a glass partition that doesn't obstruct the view. What makes this deck a true extension of the house? The deck and house floors are level and appear to be seamless. Patio doors—in this case, sliding doors—open up to the deck, and are often left open in warm weather. The hot tub and pool are accessible from several rooms of the house. In other words, it's a quick hop in and out of the spa and back into the house. The hot tub is sunken into the deck for a clean and uncluttered look. The deck's shape and steps conform to the shape and architecture of the house. On the fence about whether to install a patio or build a deck? Sometimes you can do both, and quite effectively. 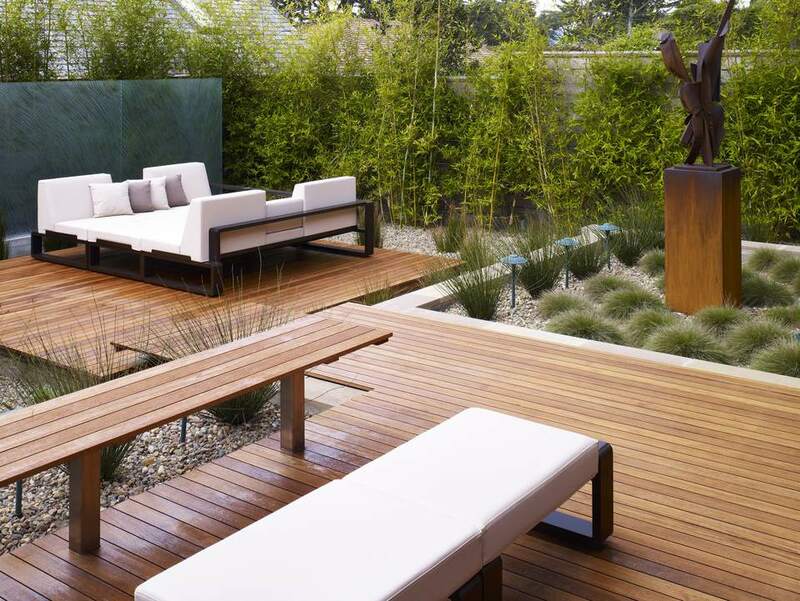 This is a fairly small outdoor space that has been well planned to incorporate a wooden deck area for dining and relaxing, while the raised patio is surrounded by tightly planted containers of various plants like small trees, vines and shrubs. The reverse could also work, with the lower level as a patio/gardening area and a raised deck for sunning and dining. This deck has an excellent view, which includes the yard below it and surrounding landscaping. The property is built in the foothills about 20 miles east of Los Angeles. Because the house sits above the yard, it was imperative that the homeowners have a durable wood deck with to-the-code hand rails. This deck and drought-tolerant garden were featured on an annual tour offered by the Theodore Payne Foundation. Hardwoods like ipe, teak and iroko (pictured) are beautiful as decking surfaces. Most are insect- and weather- resistant, sturdy, and can last for decades. Iroko trees can be growing on the west coast of tropical Africa and survives for centuries. It's also known as African teak, although it is not related to teak. Three wide steps also serve as outdoor seating, especially with square box-shaped pillows. This deck is made of ipe wood, which is a hardwood that is much like teak and is resistant to rot and termites. In regions that experience frequent rain or are prone to mosquitos and other insects during the warmer months, an enclosed deck satisfies the desire for an outdoor room without having to suffer the elements or local critters. Fiberglass is the most popular and inexpensive type of screen material for porches and outdoor rooms. Other choices include aluminum, stainless steel, copper, bronze, and sun-blocking screens. For additional comfort in hot regions, add an indoor/outdoor ceiling fan. Side yards are often used as pass-through areas, to walk from the front to the backyard, or vice versa. With wood decking added, a side yard becomes a destination. Here, with the addition of bamboo growing as a privacy screen, the deck leads to a small garden and seating area which is a secluded place to read, eat or grab some sun. Above-ground pools like this one have all the amenities of an inground pool, including a spa and two private deck or patio areas. Wood decking connects the house to the separate decks, hot tub and pool. Of course, this type of above-ground pool takes some planning, but the final result is a well-designed backyard.